You're a girl after my own heart. I really doesn't surprise me that you're a model gearhead, and most likely love the 1 to 1 sports/race cars. I've never heard of that company before, but if the kit is up to your standards, you can get decals for the 3 different Martini 917K Long Tail cars for 1971 from Indy Cals. His decals are great, and very inexpensive. This has been an amazing build to follow! I was wondering if you had a general idea of what paint mix you used? You said earlier you mixed Tamiya XF-20 Medium Gray with XF-2 White and FX-18 Medium Blue, but did you have any specific mixing ratio of the three with thinner? Or was it more of an eyeball job? Hope this summer has been treating you well! 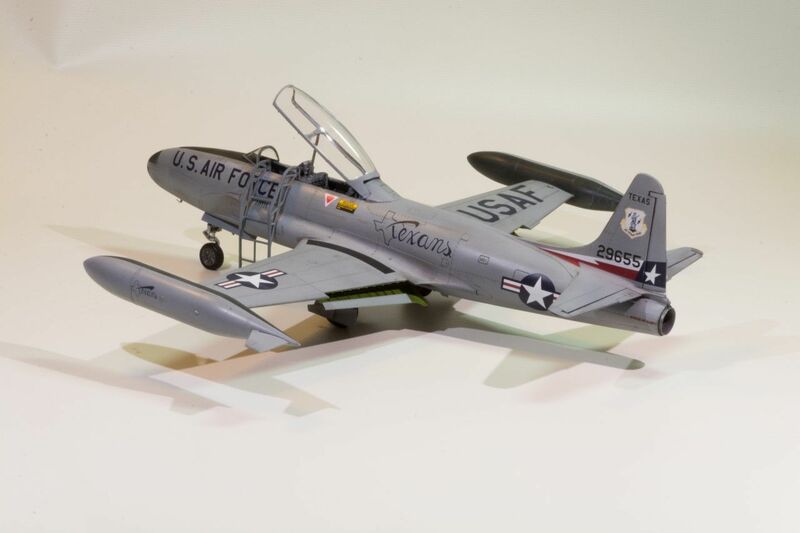 Thanks so much for your thumbs up on the T-33A build, it's much appreciated. As a general rule I always keep record of my mixes, and this time started out the same way. My 1st attempt was just way to dark, so I kept on adding white, a touch more Blue, then more White till I finally got there. Unfortunately, I have zero idea of just how to duplicate the mix. I've run into problems from time to time with other mixes that I kept on playing with and not keeping records, that when I needed more I could get close but not duplicate it. So I started off with a full bottle of XF-19 Sky Gray, and then reduced it to 3/4 of a bottle. By the time I got done with my mix, the bottle was full again. Now I've got more then enough for a few more builds. Well, it's with mixed feelings that this will be my last update on the T-33A, as it finally has crossed the finish line. Every build I complete, I seem to get some kind of emotional attachment to, since we've spent literally 3 plus months, and countless hours together from the start of our journey to it's completion. Since my last update the struts, wheels, and inside surfaces of the gear doors and dive brakes were primed with Mig Black primer, then the all received a coat of Alcad #101 flat Aluminum as in real life. The ejection seats are straight from the box, and are little mini kits that go together perfectly. I opted to make my own ejection harnesses out of strips of masking tape. The flaps were glued into place, and the last job was the taxi lights on the front strut. I didn't care much for the how the kit clear parts looked, so two applications of Microscale Krystal Kleer took care of that issue. I'd like to thank each of you who has been along with me from the start to the finish, as well as all that have stopped by and checked out the build to date. All of you made it more then worth while spending the additional time in creating this build blog. So without the need for further words, here is the finished T-33A. Hi Joel, I must admit that I too get a warm fuzzy when I put a build on the shelf that I’m particularly happy with. Your T33A, I’m sure, will be a stand out example on your shelf. I’m really enjoying the final photos a. because of the quality of the build, and b. the quality of the shots themselves. I like the close-up of the nose, it shows no trace of decal film at all, and believe me when I say I looked for it. PS I don’t follow the Auto side of kitmaker, but I’ll be trying and find your car build when you get to it. Glad I'm not the only one who feels that way at the end of a build. It's kind of like parting ways with a close friend. Sure we can visit anytime we want, but it's just not the same feeling anymore. Thanks for the big thumbs up on how the T33-A turned out, as well as my photographs. Photography is my other hobby, and saltwater fishing the only sport I do these days. I've always seemed to have an issue with a few decals on most of my builds. Finally, after watching Paul Budzik's video on decaling for the millionth time, it dawned on my he doesn't gloss coat his models including Matt finishes. His paint is that smooth. So while I can't get my primer and color coats as smooth as his, I buffed each coat till it was smooth including the Glosscoat. the end result is that none of the clear decal film anywhere shows, and there is a ton of it in those large decals. if I can do it, anyone can. Saltwater fishing, you don’t say. I’m partial to a bit of Kayak fishing in our harbour down the road. Unfortunately, there hasn’t been a lot of that lately, just not enough time in the day to do everything I want to. Beautiful Job my friend ! Must be getting close to Porsche time. Might that be 9:17 a.m. or p.m. ? I've been thinking about a small open style kayak I can put in my car and fish the backwaters of the harbors. Even the back of the inlets are fine. Thanks so much my friend for those most kind words. Coming from someone with your skill set, means quite a lot to me. I've actually started the Porsche as I need to convert the Sebring version to the LeMans version for 1971 but not the long tail version. I'm more then halfway through it, as it's not that much of a big deal. When I get a little more done, I'll make my 1st post. Joel! That one really turned out sharp! I was a bit sceptical of the all-grey scheme to start with but it really looks good when finished. The T-33 is an attractive aircraft and I'm amazed how long it served being based on a first-generation jet. Even if the swept-wing birds look faster the T-33/P-80 is a sleek design! Wow, I have missed this blog, but it was going through it now. You certainly have a very nice representation of the T-33 there Joel. Looking forward to Your next project. thanks so much for stopping by, it's always appreciated as is your most positive comments. I was also somewhat concerned about the monotone gray paint scheme, but with a little weathering and enough decals, it holds it own interest level. I just might do a F80 down the road as I really like the simple lines of the aircraft. so glad that you enjoyed your walk through my build presentation. I really enjoyed every step of it. I've started my next build which is in the Automodeler site. It's the 1/24 scale Fujimi Martini Porsche 917K. Right now my plans are to alternate between aircraft and autos. That is if I can produce an acceptable gloss finish. Lovely work as always! Darn it - I can't believe I missed the big finale by a month! Totally my bad - with my focus on book-builds, I've just been ducking in and out of Aeroscale to publish news and reviews and have neglected to check the Forum. It's ironic that you mentioned a gloss finish in your last post - I was actually thinking about just that today for a little "light relief" side project to help me re-focus on the tasks at hand. A really good scale gloss finish isn't something to take for granted - it can all too easily look toy-like. So glad you stopped by. I'm always thrilled when you do so. Sure hope that your book builds are going as planned. Can you even post a teaser every once in a while just to stay in touch with us? I'm not supposed to, but I will try find a way to post something at some point. I'm sure there'll be a time when the publishers start thinking a leak or two might be cool. Meanwhile, I do want to build something on Aeroscale again(!) - so I will try to squeeze in a Blog if I can before too long. Probably something a bit "left field" - and nothing to do with the book. If you can, that would be great, if not, we all certainly understand. Personally, I just miss seeing you around as you've been a fixture here since the day I signed on. How about one of the many previously started builds that never got to the finish line? I'm sure that some of them just might be what you're looking for. You know me and old builds! - I've got the attention span of a flea (and that's probably an insult to fleas! LOL!) - so it'll almost certainly be something new. On a purely practical note, I packed all my surviving old builds away to make room to do the book and Silver Wings builds, so it's easier to start from scratch (and more fun? - did I say that?! LOL!). So just how many boxes did it take to pack away all your started kits? Looking forward to seeing what you finally decide to build. Actually, there is an unfinished build which I made a specific point of not packing away - FRROM's 1:32 IAR-80. I've been itching to get on with it, so this is the perfect opportunity. Go for it. I'll be with you from day 1 till you cross the finish line. But as a gentile reminder, I'm 70 now, so PLEASE finish it sooner then later.